April Wright-Hickerson began singing at the North Richmond Missionary Baptist Church, in the Bay Area of California, at eight years of age. Since then, April has sung, lectured and directed choirs locally and internationally. In addition to her on stage career, including winning an Arty, in 2011, for Best Supporting Actress as Aunt Em/Glenda in the “The Wiz” and, performing with the famed Lorraine Hansberry Theatre of San Francisco, CA in Stanley Williams’ adaptation of Langston Hughes’, “The Black Nativity.” She’s been a guest speaker at the Multicultural Peace Education Seminar held in Cairo, Egypt, and has been a guest clinician for Grammy Career Day. 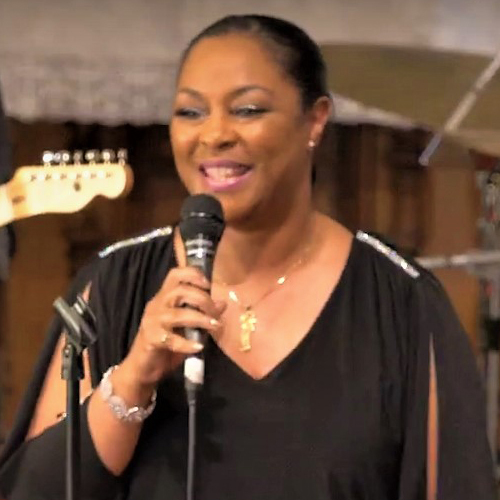 She also a local Radio favorite – and she can be heard each Saturday morning on KPFA 94.1 FM as co-host of Emmit Powell’s “Gospel Experience.” And now, too, with Narada’s Great Gospel Show, April vocal talent reaches new audiences coast-to-coast as well.